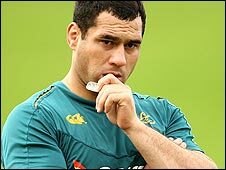 Australian flanker George Smith will become the 10th player to win 100 Test caps when they face New Zealand in the Tri-Nations at Eden Park on Saturday. Smith, 28, becomes the fourth Aussie to reach the milestone when they meet NZ in the Bledisloe Cup in Auckland. His opposite number Richie McCaw said: "He's a fairly smart player and when he gets in and has a crack at the ball or carries the ball he is very effective. "He doesn't make poor decisions and that makes him a pretty classy player." Smith, who joins fellow Australian George Gregan (139), Stephen Larkham (102) and David Campese (101) in the centurion club, is keen to add plenty more caps to his tally, signing a contract with the Australian Rugby Union (ARU) until after the 2011 World Cup. "The decision was made in conjunction with my family and my wife," said Smith. "Their interests were the top of the list. "Staying in Australian rugby has got the stability for me and staying for the 2011 World Cup was a factor. I think this team is building towards great things and I definitely want to be a part of that." McCaw, who has just returned from injury, will be playing his 200th first-class game and Australian coach Robbie Deans believes his impact on the All Blacks cannot be underestimated. The Aussies have not won at Eden Park for 20 years and Deans is mindful of last year's clash, when New Zealand bounced back from a 19-34 loss in Sydney without McCaw to thrash the Australians 39-10 with McCaw in Auckland. "Richie returned for that game and the transformation of the All Blacks side that night from the one we played in Sydney was remarkable," said Deans. "We went in hopeful and thought we'd prepared effectively. The ferocity of the All Blacks response is exactly what we're going to experience on Saturday." New Zealand are also boosted by the return of number eight Rodney So'oialo (neck), while Stephen Donald wins the race for the fly-half spot ahead of Luke McAlister. Champions Australia welcome back number eight Wycliff Palu from injury, with Richard Brown moving to flanker. Dean Mumm, who began at blind-side flanker in the 22-6 victory over France in June, drops to the bench. Sitiveni Sivivatu, who also missed the All Blacks' June Tests because of a shoulder injury, takes his place on the left wing while Hurricanes back Corey Jane moves to the opposing flank, with Joe Rokocoko relegated to the replacements' bench.